In past years the Grand Prix has taken place alongside violent repression, even deaths, in the Kingdom of Bahrain. Human rights campaigners fear what the 2017 race might trigger. Grand Prix of Bahrain, 2015. HOCH ZWEI/DPA/PA Images. 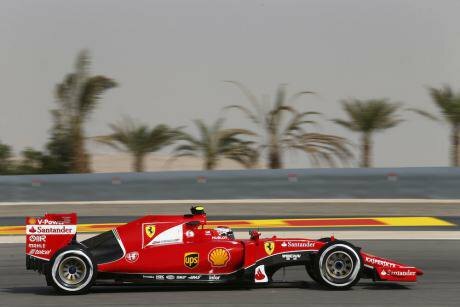 All rights reserved.The Formula 1 Grand Prix is set to hit Bahrain from 14 to 16 April. As it stands, the world will hear the whir of race-cars, crackling fireworks and loudspeakers’ booming choruses. “If you like sunshine, sand and the sea, then you will love Bahrain,” beams F1’s online Destination Guide. It could all sound very rosy indeed – that is, until you listen beyond the fanfare and overhear the host government’s furtive attempts to silence those who might leak its abuses. Yet the authorities’ efforts to censor civilians failed in 2011, when the race was cancelled as the government declared a state of martial law to stamp out mass pro-democracy demonstrations. One year later the race was back. The night before the 2012 event a father of five, Salah Abbas, was killed by police after having been tortured and shot. The Bahrain Grand Prix went on. Just before last year’s event a 17-year-old boy, Ali Abdulghani, was reportedly hit twice by a police vehicle and, as the 2016 race came to a close, he died from injuries suffered during the arrest. The violence happened in a village only three miles from Bahrain International Circuit. The teen’s charges related to him having taken part in a protest. If you like sunshine, sand and the sea, then you will love Bahrain. For F1 there’s no mentioning the prospect of an undeclared martial state throughout their event. Sayed Alwadaei, Director of Advocacy at the Bahrain Institute for Rights and Democracy (BIRD), warns that an “intensified crackdown” would be the reality. “Villages will be under siege,” he said. "Arbitrary arrests always increase when the race is held, and many of those arrested are then tortured and unfairly prosecuted. “Formula 1 should not forget their responsibility to ensure the safety of the people of the host country. If Formula 1 cannot do that, then the Grand Prix should not go to Bahrain,” Alwadaei added. His relatives in Bahrain have been ill-treated, interrogated regarding his work, and imprisoned on fabricated charges. On 5 April, four campaign groups (Americans for Democracy & Human Rights in Bahrain, ARTICLE 19, BIRD, and Gulf Centre for Human Rights) sent a joint letter to F1 chairman Chase Carey and the managing directors. They call for this year’s race to be suspended in light of the alarming situation in Bahrain and note F1’s 2015 Statement of Commitment to Respect for Human Rights. The campaigners’ letter lists previous human rights abuses by Bahrain, adding that violations have been “a common occurrence” during Grand Prix races there. Among those targeted in the past year was award-winning journalist Nazeeha Saeed, who received a travel ban without explanation last summer. She then faced a charge of working as a correspondent for foreign media outlets without authorisation. 43 NGOs signed a letter expressing deep concern at the charge, and Reporters Without Borders urged Bahrain’s authorities to abandon the trial in January 2017. Saeed had suffered before at the hands of the police. In 2011 she was allegedly tortured for 13 hours after police detained her for coverage of pro-democracy protests, where she witnessed the police killing a man. Four years later the judicial authorities decided that the officers responsible for torturing her would not be prosecuted, citing insufficient evidence. Yesterday a Bahrain government spokesperson said the country had implemented "a range of institutional and legal reforms over recent years, in close collaboration with international governments and independent experts.” The spokesperson continued: “As a result of these efforts, Bahrain now has a number of internationally recognised safeguards in place to ensure human rights abuses do not occur." Nabeel Rajab, President of Bahrain Center for Human Rights, remains in pre-trial detention on charges relating solely to freedom of expression. He faces up to 18 years in prison. In January the Bahrain government unlawfully executed three individuals whose convictions were based on confessions extracted under torture, according to the campaign groups’ letter this month. The campaigners say that the few institutional changes made since the violent suppression of pro-democracy demonstrations in 2011 are having no appreciable impact on the increased suppression of legitimate protest and the free press through state violence, as well as the criminalisation of innocent citizens and human rights activists. Campaigners are seeking two possible results. The first, though unlikely, is (as stated in the letter) that F1 will call off their event in acknowledgement of Bahrain’s human rights abuses. The second, and perhaps likelier, is that if the race takes place then journalists will use the rare window into Bahrain to report these violations. The world’s media should not sit by while the country’s authorities try to rose-tint this view. Brian Dooley, Senior Advisor of Human Rights First, pointed out the impact of sports journalists reporting human rights abuses in Argentina during the 1978 World Cup held there.